By the mid-twentieth century, North American planning policy, institutional finance, and architectural convention aligned to support, albeit highly unevenly, a market system for entry-level housing. In suburban landscapes across the continent, the conventional “starter home,” a loose model for small-scale, affordable detached housing, began to emerge—promising a very real leg up for young prospective homeowners and unprecedented upward mobility for target populations. Today, the city—the center of social and economic opportunity—is virtually cut-off to entry-level housing. 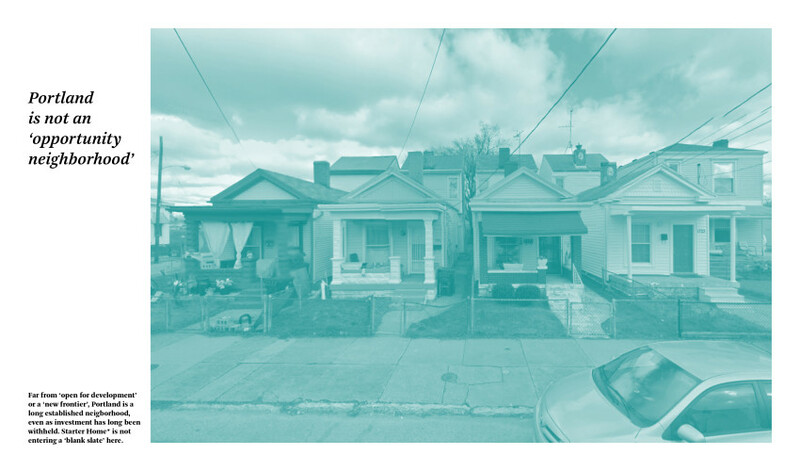 “Louisville” is the latest in a series of architectural investigations called Starter Home*, undertaken to interrogate the American mythology and model of homeownership through immediate and concrete architectural work. Starter Home* was launched by our practice, the Office of Jonathan Tate (OJT), in an effort to develop creative design responses to entry-level housing types in core urban contexts—sites where, in an unsubsidized market context, all but the highest market segment housing is foreclosed by a variety of policy, finance, and architectural conventions. Much like the mid-twentieth century informational guides produced by the Federal Housing Administration, Starter Home* outlines broadly structured, but formally indeterminate, design frameworks to form the basis of fully realized site-specific architecture.1 The project is two-fold, moving back and forth between active design development and written design research—one informing the other. 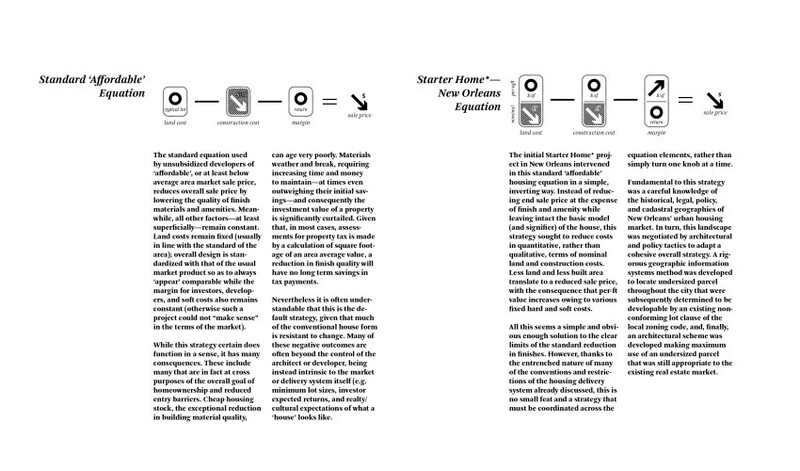 The guidelines outlined in the two previous iterations of Starter Home*, Volume I (2014) and Volume II (2015), are built out of engagements with and interventions in the realities and specific urban contexts of New Orleans, Louisiana. While the Federal Housing Authority’s Principles for Planning Small Houses, for example, provided outlines for practice in the newly-opened greenfield conditions of mid-century suburbia, Starter Home* focuses on the tight urban market contexts of historic core neighborhoods. Louisville map. 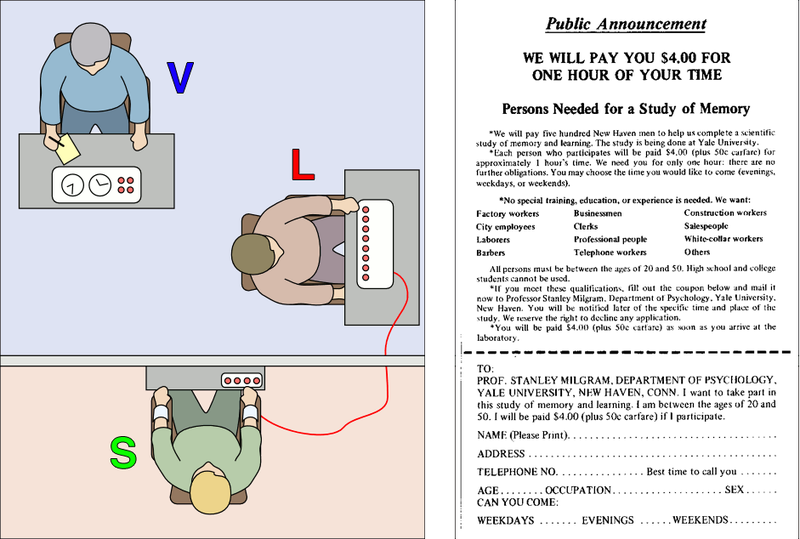 All images courtesy of OJT. Starter Home* is iterative: a loose set of design and development strategies developed between site and situation research and design. It is multifaceted—neither a precious one-off nor a mindlessly repeatable type. Our approach therefore never starts with architectural form, but by interrogating urban form and the problem of housing. Research does not reveal possible form but instead possible issues to address through design; it prompts a question, not an answer. Together each iteration successively produces a “design thesis.” Since its initial formulation, the project has successfully developed a number of built proofs-of-concept in more than a dozen units of infill construction in New Orleans. The newest iteration, Volume III: Louisville, attempts to test and enact these design strategies within the Portland neighborhood of Louisville, Kentucky—against a site with an altogether different market and fabric. This piece will trace the development of the project’s design-research methodology to arrive at the site-specific design thesis, which materialized in Louisville. First, though, we will begin with the site: learning from its landscape and identifying our own design-development goals. Whereas the New Orleans context typified the high land cost, tight market, and form-restricted historic core neighborhoods of many gentrifying urban districts in North America, Portland’s market is antithetical in nearly every way. 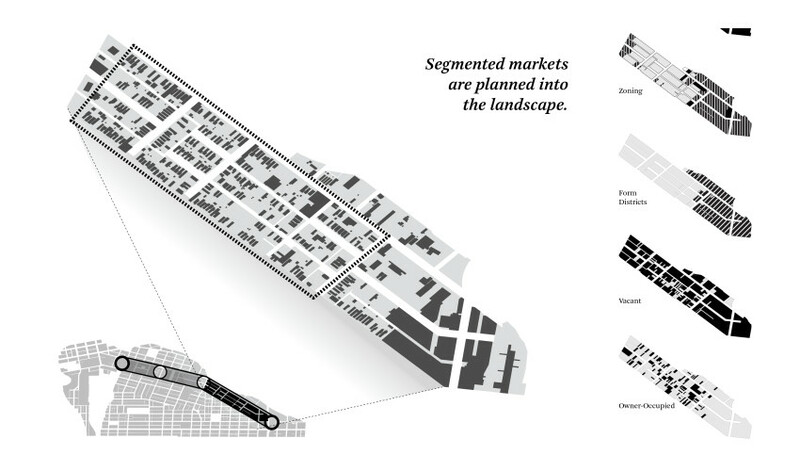 Our research revealed a landscape in opposition to typical market-driven housing strategies. Here, “opportunity sites”—available sites that meet the architectural and financial requirements of certain models of development—must be created, not simply revealed. New housing investments don’t retain their value; the market doesn’t support them at resale. Existing structures compete with vacant parcels for investment. While these challenges seem to imply the impossibility of market-based development, much less entry-level market housing, they became our starting point to imagine new forms of housing—design provocations rather than limitations. 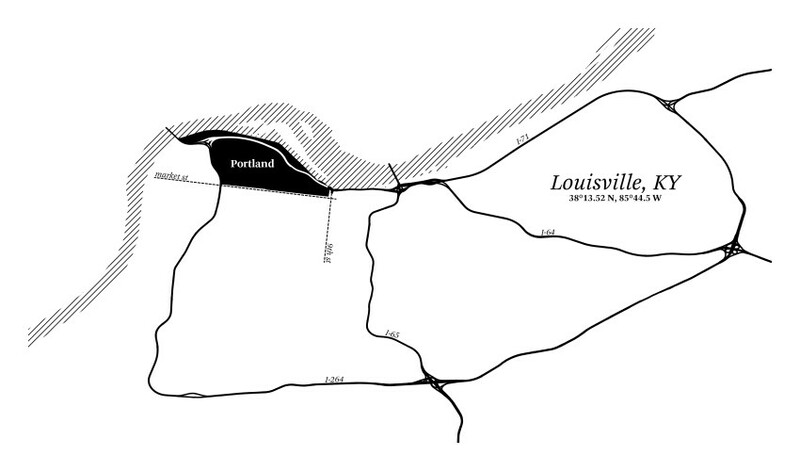 While centrally located on the west side of downtown, Portland has historically been the site of deep disinvestment. It has, for this reason, been a de facto haven for unsubsidized affordable housing. However, it is also increasingly the site of a greater-than-AMI (Area Median Income) market from elsewhere in the urban core and the inner-ring suburbs. Scattered with vacant lots, structurally compromised buildings, and otherwise neglected housing stock, Portland is increasingly becoming the place where above and below-AMI markets rub against one another. Whereas New Orleans sought “hidden potential” in the small and difficult parcels dispersed within high-demand urban core neighborhoods, Louisville abounds with developable parcels. Design must “make sense” of these sites according to development: that is, make them legible to an investment model. Finding a parcel in Portland to build on is the easy part. It is historic disinvestment, however, that poses the greatest hurdles—undermining the ability for any new structure to maintain its embodied value and thus forestalling infill. Designing for a broader “infrastructure” of investment retention in the neighborhood means supporting a property’s everyday value while simultaneously guarding its future resale value. 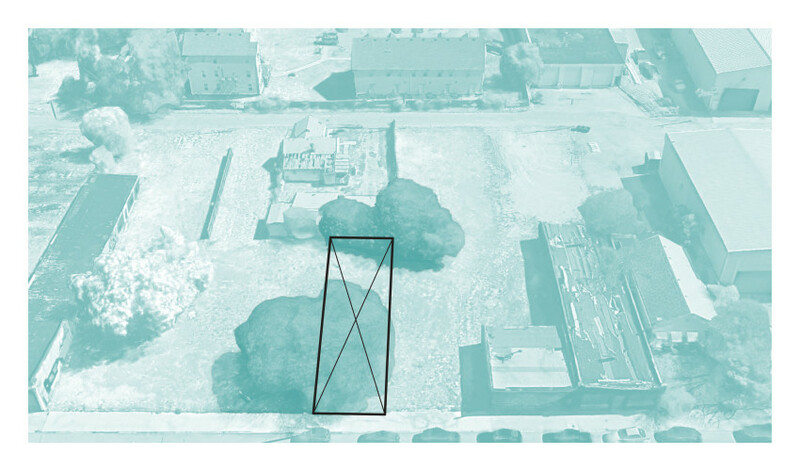 To design for value retention materially means to design a strategy for new investment that exists alongside the basic needs of the existing landscape, like structure stabilization and vacant lot maintenance. At the same time that the existing fabric is stabilized to support new development, it must also be safeguarded against replacement. As two fabrics and two markets meet in a single neighborhood, they must be balanced against one another. Starter development benefits from typological diversity, not mass development. Starter development is concerned less with structural diversity, than with a range of structures and investments that maintain diversity of use, markets, and neighbors. “Starter infill” must build alongside neighbors, not despite them. 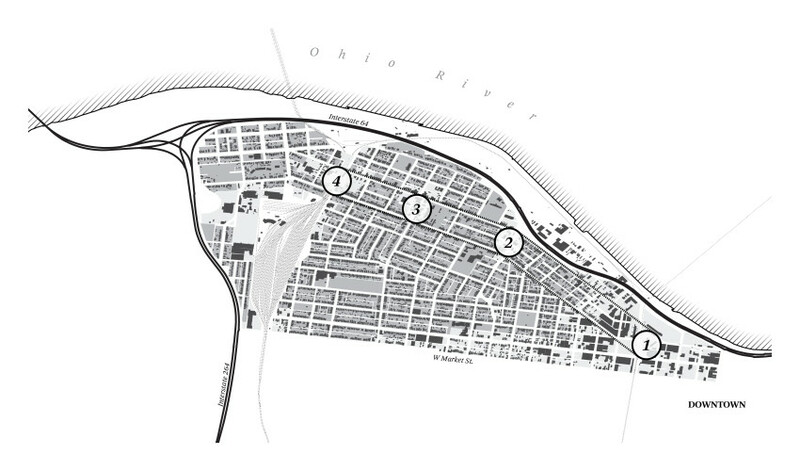 Like any hypothesis, this thesis was generated by working through various considerations, in this case through different environmental scales: The Louisville Market; Portland District; Portland Avenue Row; Block 015K; and The Market Housing Equation. The thesis coalesced with the realities of architectural form, the limitation of zoning and form provisions, and the demands of development pro forma on an individual parcel, and points to a range of possible programmatic arrangements and architectural forms. The phase, currently underway on the ground in Portland will not be detailed here, for the articulation of this larger iterative design-research process is our focus. 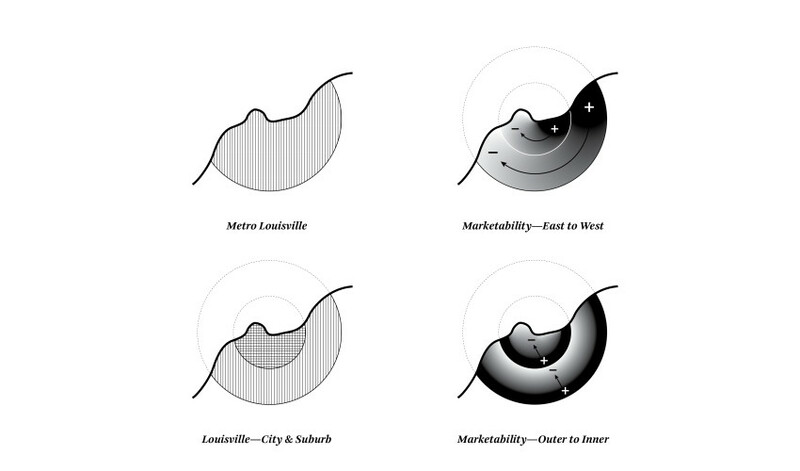 The character of any core neighborhood is broadly determined by its situation in Louisville’s wider metropolitan and suburban fabric. While distinct from the city proper and its urban core neighborhoods like Portland, these peripheral communities nevertheless have complex influence on the urban core, its morphology, fabric, and markets. More than marketability, the housing stock and market fray along segments of area median income. 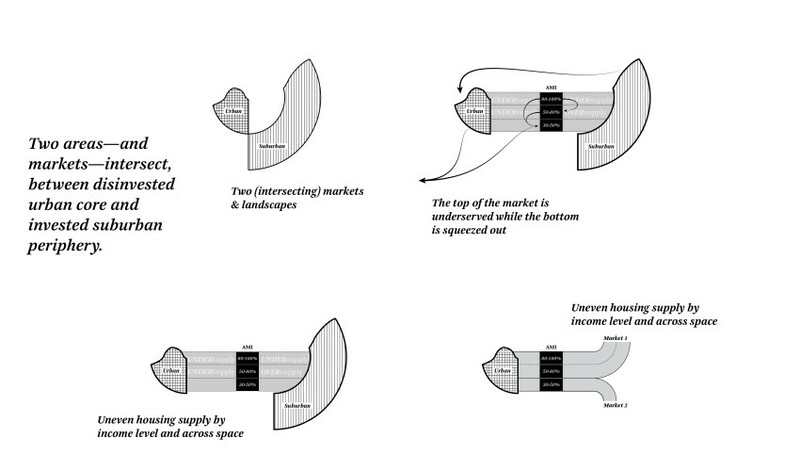 Uneven supply allows demand to ripple down the chain of AMI segments and classes of housing stock. An undersupply of housing in the suburbs catered to the median-income level drives middle-market buyers to consume the oversupply of lower-priced housing in the suburbs. In turn, below-median suburban (50-80% AMI) buyers find themselves either squeezed into substandard suburban stock or driven out of the suburbs altogether into urban core neighborhoods like Portland—which are already experiencing competition for the undersupply of entry-level housing stock. All this leads to a “pushing-in” of mid-level income residents and a “pushing-out” of the lowest income residents in the western urban core. Here in Portland, where metro marketability is at its lowest, an oversupply of land and housing stock meets a “pushed in” middle income market and an increasingly imposed upon lower market segment of residents. 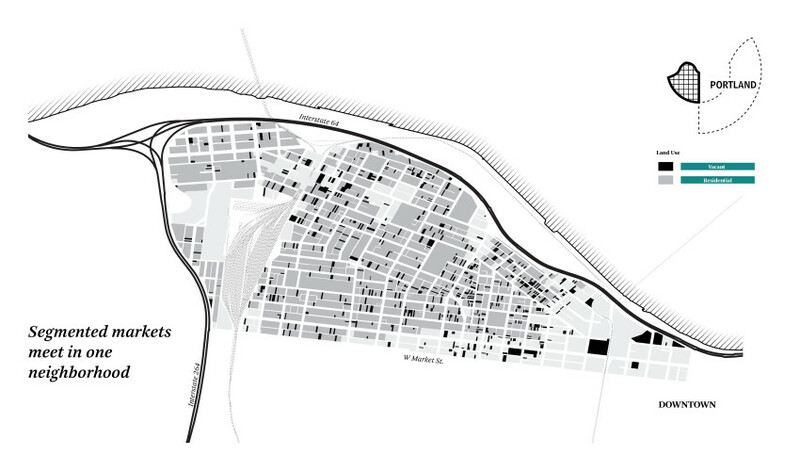 These segments meet within an urban fabric that is highly heterogeneous, ranging from active industrial uses to established affordable residential fabric, pocked throughout with a significant set of vacant parcels. In Portland, the housing supply must serve two distinct but intersecting markets at once. Portland is not a small district or an isolated enclave, but rather a diverse neighborhood, morphologically and programmatically, with 773 developable acres (i.e. non-right-of-way)—67 of which are vacant and mark the entire district, residential and industrial. 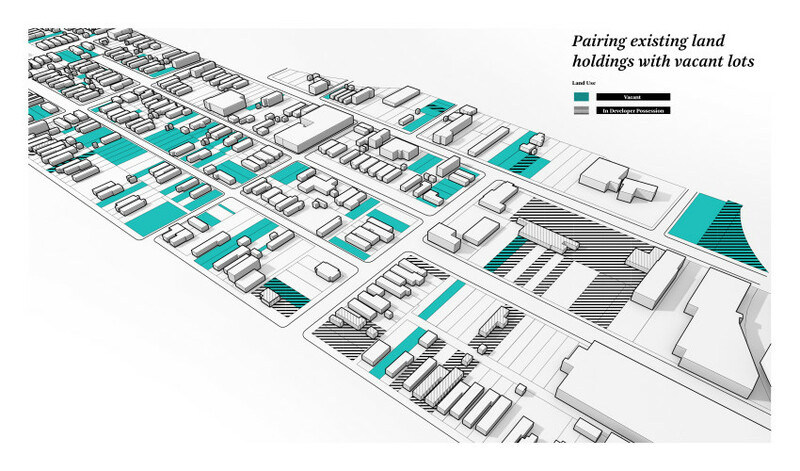 The segmentation of Portland’s two markets is paralleled—even made possible—by many entrenched and historical systems of planning, use, and custom. Cadastral, use, and form designations each carry their own segmenting restrictions on the fabric of housing stock and the shape of housing markets. A Starter Home* that would serve these two markets simultaneously must work across entrenched folds in the landscape and engage the fundamental categories of urban land central to the district’s landscape: residential and vacant parcels. In both total area and ubiquity, these categories are inextricably entwined. However, even though they can be categorized, residential and vacant land uses are far from homogenous and defy easy typological prescription. The terms “vacant” and “residential” unravel quickly along qualities of form, occupancy, and especially structural stability. 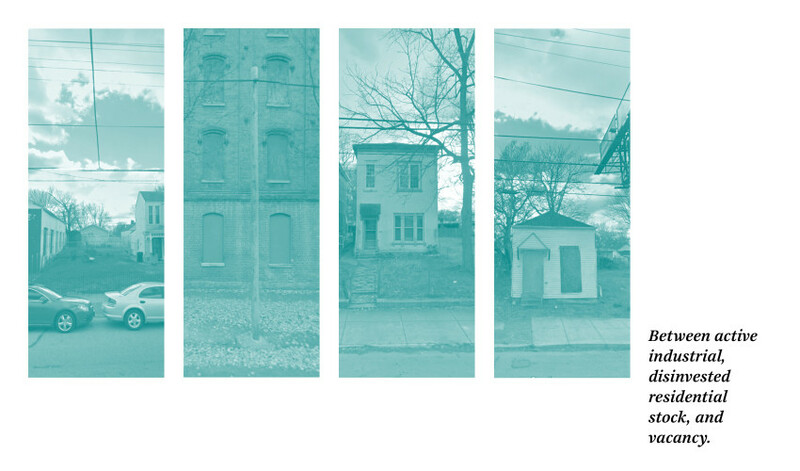 Historic disinvestment has wrought not only scattered vacant lots but also significant neglect of still-extant residential structures—nearly two thirds of which require some structural stabilization. If any refinement is possible, it would occur in vacant and stable parcels, and parcels with immediate or near need of stabilization. 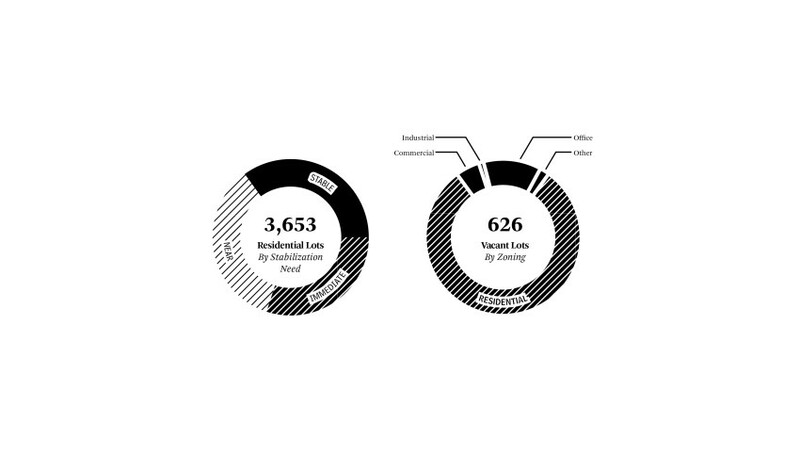 Residential and vacant lot pie chart. The integrity of these seemingly stark categories is further diminished, to some extent, by their frequent interlacing in everyday practice. Vacant parcels bleed into one another producing great unmanaged swaths, and abandoned land and structures are informally taken over by enterprising neighbors. Clear structures of ownership or definitions of “highest and best use” are blurred on the ground. Starter Home* development therefore plays with four articulated categories—vacant; residential, structurally stable; residential, near need of stabilization; residential, immediate need of stabilization—and the formal, legal, and practical entanglements they yield in order to serve two intersecting markets. Honing in on a single segment of a central axis of development reveals a landscape significantly divided, with the median and below-market populations split apart into separate enclaves by multiple financial, architectural, and policy workings. 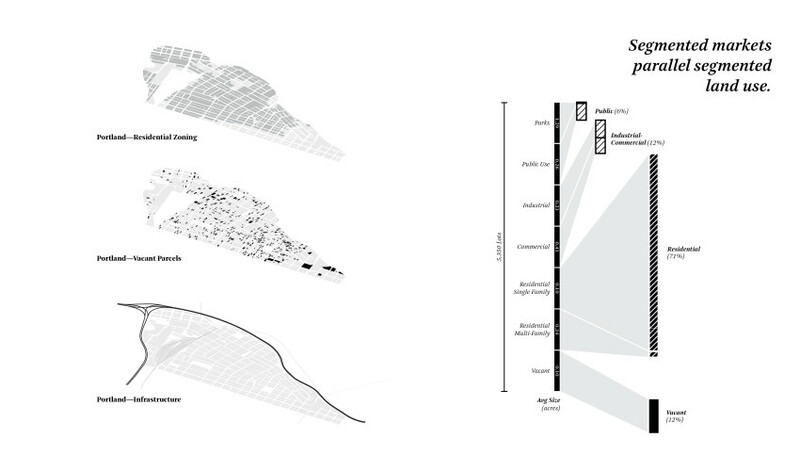 Disinvestment has intensified the hollowing out of the built fabric, deepening the segmentation of the neighborhood fabric materially, spatially, and economically. Residential blocks have shrunk considerably over time down to a few scattered still-occupied homes; and atrophied commercial and industrial districts have relinquished parcels to other (larger) uses, withdrawn commercial services, and consolidated the few investment-generating activities. New development has the potential to significantly impact the shape of Portland’s historical pattern of segmentation—playing with, intensifying, counteracting, weaving between, and transforming aggregate investment and residential form. However, in order to do so, it must reject typical developer-driven urban redevelopment schemes that intensify divisions—like concentrating investment in one area while “smoking out” what’s left through targeted, intensified disinvestment. 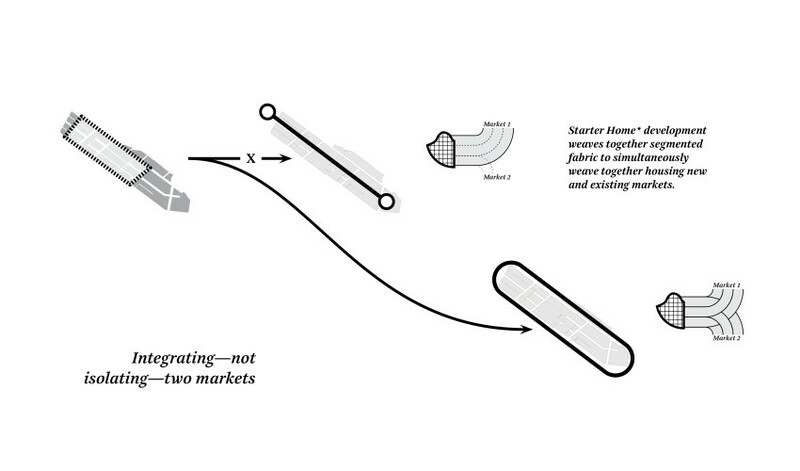 This “point-loaded dumbbell” strategy intensifies segmentation and concentrates development at strategic nodes in the corridor—inevitably commercial-industrial, those zoned to highest use—leaving the existing market (and its fabric) to deteriorate and eventually be replaced wholesale by the anticipated new market. This strategy deepens the already-existing “push out” tendency apparent in our market study. A Starter Home* strategy looks for ways to stitch segmented markets, uses, and housing stock together, programmatically and architecturally. It proposes to instead spread investment across smaller, more targeted sites, linking them to the existing fabric. 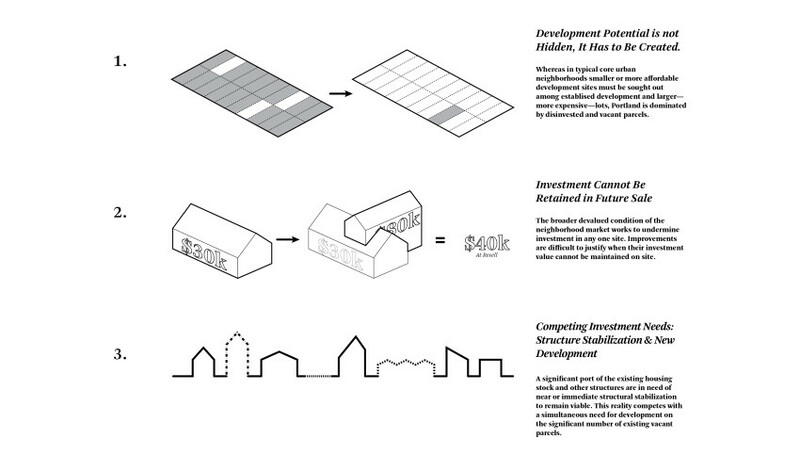 Starter home development puts “meat on the bones” of existing housing stock, rather than tactically starve certain parts of the neighborhood in order to leverage difference of form across parcel, market, and use—producing a wider dispersal of investment impact, a more stable development pattern, and a more integrated fabric. The vacant properties so ubiquitous in Portland promise new opportunities for development. However, nestled and scattered among still active residential parcels, they are difficult to incorporate into large, systematic development strategies. That said, the process in which a developer acquires land is often equally scattershot and wide-ranging, due to the rambling and serendipitous minutiae of property ownership chains and the real estate market more generally. Overlaying these haphazard patterns—vacant parcels, active residential structures, and large land-holding networks—allows us to imagine a new development strategy that connects the idiosyncrasies in a more coherent, but no less neighborhood-enmeshed way. These tactics allow us to develop a more nuanced, site-specific, and realistic approach to market housing supply. Pairing parcel networks, both vacant ones with existing structures and vacant ones with developer-held lots, helps drive development inertia forward by integrating two markets: the stabilization of existing structures (affordable markets) and new construction on vacant parcels (new markets). On a block with less than half of its existing parcels occupied by structures, design is, on the one hand, greatly simplified (with little to confine it formally or programmatically), and on the other hand, subject to uncertainty and potential devaluation (originating from the surrounding vacant lots). Any Starter Home* response must therefore look forward, beyond its own boundaries and design intentions, to its relationship with its surrounding landscape over time and space. Anticipating the present and future condition of the environment around it ensures a climate of development, which in turn helps to retain certain forms of investment. The aim is, broadly, the stabilization of the land, in its use and value, on the block. But it is also, more specifically, a strategy that continuously anticipates the way development allows for new development and new value as a whole. It considers the many patterns of large land ownership in the area, public and private, to seek out new connected opportunities and adjacencies. Starter Home* looks beyond the lot. 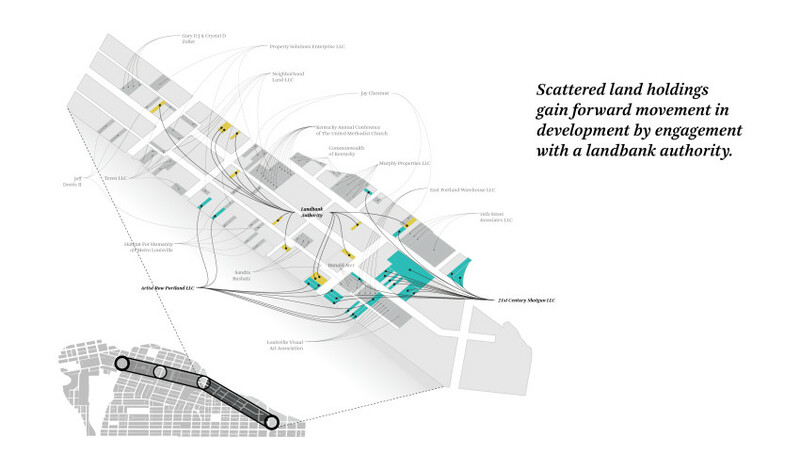 Overlaying an additional pattern of large holdings in Portland, enables the possibility of expansion in form and connection in program and opens up a greater range of future development. Interweaving these three networks—acquired properties, vacant, and large holdings—introduces, through diversification, greater stability and flexibility into an inherently indeterminate future-unfolding development process. 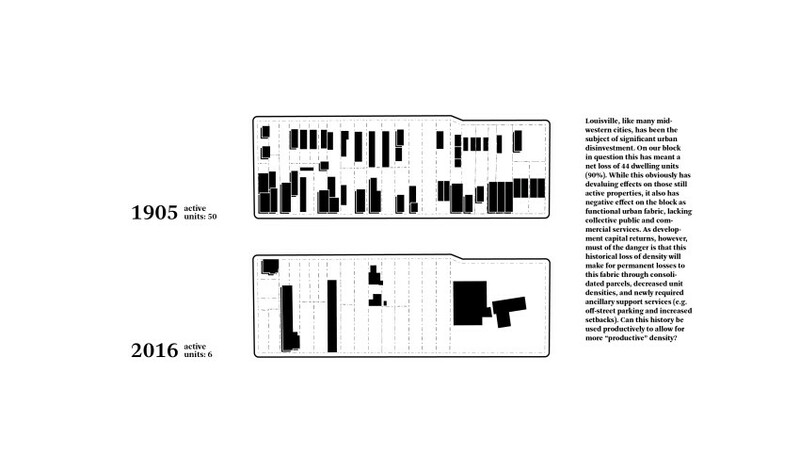 Only by looking at acquired, vacant, and large properties together do adjacency opportunities become more apparent in “clusters”: locations where all three patterns of property ownership meet and align in close proximity. These adjacent opportunity sites—which maximize and diversify the possibilities of a site—are not defined by an alignment of two layers (actively held/vacant parcel; land-banked property/actively held; so on), but rather occur when all three come together. Ownership pattern on the black scale. 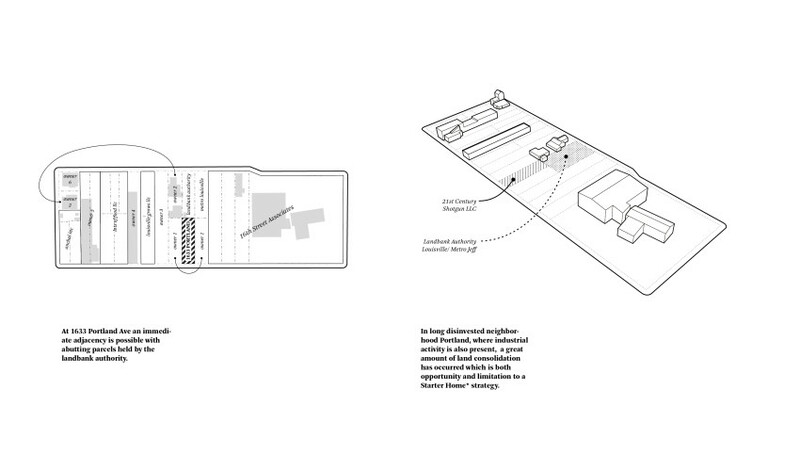 This way of reading and locating potential opportunity in a landscape ensures a more diverse set of possible design responses and interventions in any given site. While development could be paired with a simple “off-the-shelf” design on an adjacent vacant lot, other more complex strategies or designs of adaptive reuse, the expansion of an initial project or an entirely new program or form, might be more appropriate. 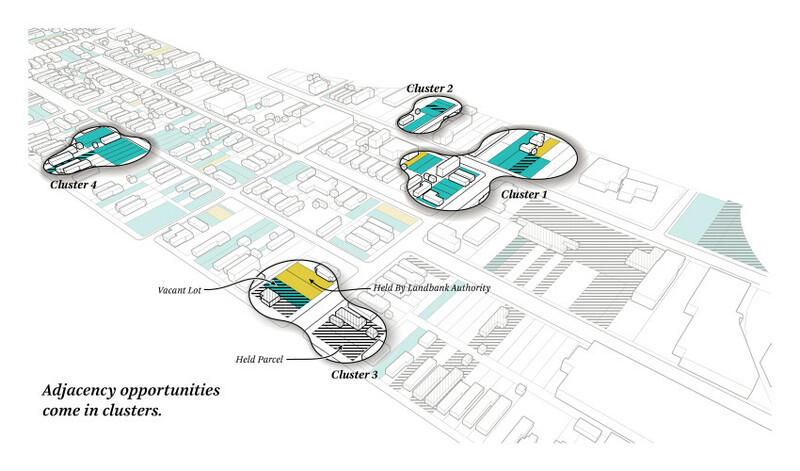 The heterogeneous clustering of lot types allows development flexibility. Clusters can accommodate variation, whether in the type of land, program or form, which in turn means the possibility of supporting two markets. Starter Home* is not a project about form. Charging design research with the task of tackling urban entry-level market housing does little if it yields only a model housing type. Focusing that same design research on housing’s delivery system, specifically the “market housing equation,” is essential if the goal is to produce more than a single iteration. The market housing equation refers to the specific configuration of economic and political factors that governs the shape of nearly all housing delivery systems in North America, affordable or otherwise. While it is not universal, the equation does have a few common factors whose relationships can be generalized. Understood nominally, the market housing equation consists of: land cost (L), related to the location and required size of a parcel; construction cost (C), the total constructed square footage and the quality of labor and finishes; and margin (M), understood as the expected rents and returns of equity partners. All this must be balanced against a final sale price (P) which, if considered “entry-level” in most core urban neighborhoods, cuts beneath the prevailing market of any given area. While each term in the equation is connected to one another, the nature of their connection is never fixed or predetermined, and should be understood as a reconfigurable design element. Not all of the elements are equally, or similarly, open to design intervention—all possess a certain degree of formal “stickiness,” that is to say, they are constrained by custom, convention, institution, or other structural factors that mark the urban market housing delivery system; and in the realm of investment, construction, realty, planning, or geography, all constitute the very idea of housing. 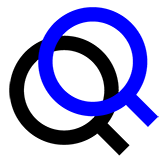 No single element can be changed on its own without triggering a cascade of effects on the other interconnected elements. If Starter Home* is to be a coherent design strategy, it must necessarily open the market housing equation up to design intervention. Extending design thinking to this equation means transforming not the site of any one house, but instead the entire system of housing provision. Doing so means forcing design to confront the entrenched realities of the many extended factors of conventional housing delivery and the intertwined complexities of the market equation’s key elements. The market housing equation is in fact far more complex when positioned in relation to the scales of time and space in which it operates. To date, our Starter Home* projects in New Orleans have largely maintained the typical scale and horizon of development—borrow-build-sell, repeat. However, in a place like Portland where disinvestment has been so intense, we must look beyond the scale of a single lot, loan term, or simple isolated quick returns. 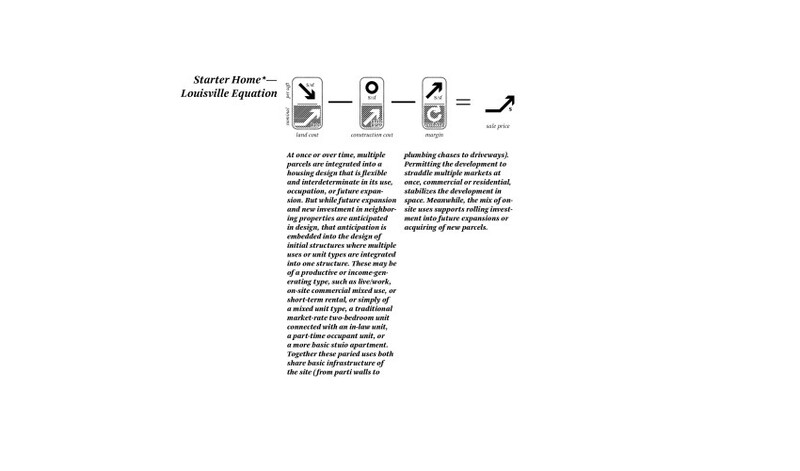 The equation must stretch to imagine and project rolling development activity and wider-spread investment. The state of the existing housing market in Louisville and the specific geography of the Portland neighborhood calls for an entirely different way of thinking about and applying the market housing equation. Whereas New Orleans’ core urban housing market was tight and dense to the exclusion of entry-level home price points, Portland’s landscape is marked by both a surfeit of land and structures that need to be structurally stabilized and safeguarded against disinvestment and new investments intended to produce and retain value. Value, overall, needs to be created, secured, and maintained in new and existing construction. 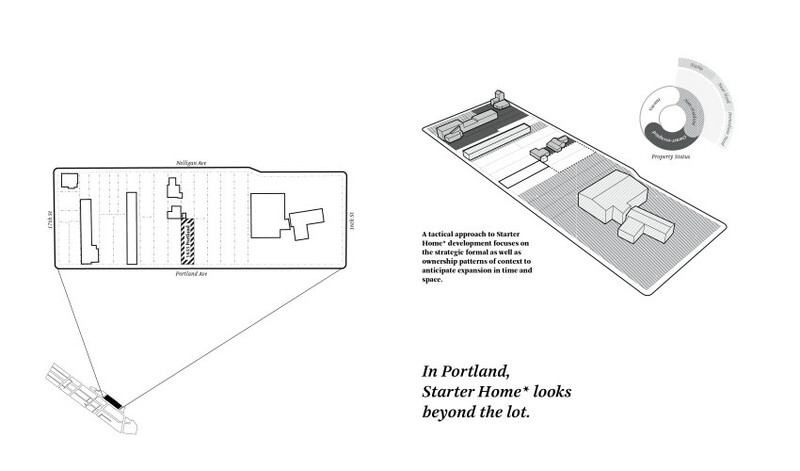 Starter Home*—Louisville redesigns the market housing equation in Portland by spreading the “value” of development as widely as possible. Spatially, investment is distributed among multiple smaller installments, stabilizing existing structures and seeding new sites thanks to low dollar thresholds. Over time, the risk and return from development can be shared across a single and continuous process of growth that may extend between one investment site and the next. Low land costs allow a form of development that spreads investment across many parcels and stabilizes land costs, debt service, and fixed investments. Any development site may accommodate or pair multiple and various units or uses to provide for two disparate markets. This flexibility stabilizes each market with the other. Unlike previous iterations of the design thesis, the low cost of land allows starter home development to operate on multiple sites at once—simultaneously or incrementally—rolling costs and returns over multiple cycles and stabilizing overall development and new neighborhood investments. Starter Home* does not intend to produce a new architectural prototype to “save” the urban housing market. Instead, it proposes a process for developing site-situated design-research strategies and for thinking through the problem of entry-level market housing in core urban neighborhoods. This process and its strategies will continue to evolve as our office works to translate the design thesis to another proof-of-concept design in the center of Portland. An iterative design-research methodology permits us to discover site-specific answers to an overarching question: “What does an urban starter home mean today?” Here, a “loose-type” but site-specific architectural strategy means one that, on one hand, responds to the design thesis from the broader state of housing delivery in the Portland neighborhood and Metro Louisville as a whole and, on the other hand, solves the specific idiosyncrasies of a given site. 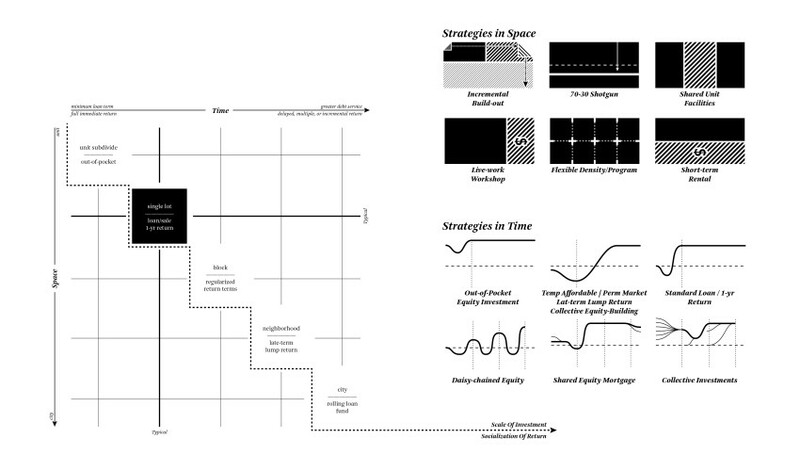 A loose-type strategy is not a tool to develop a single response, but an open-ended schema for unfolding investment in a network of architectural forms across multiple sites and cycles of development. Design research allows us to understand architecture, in both design process and construction, beyond any one site—as an unfolding process that responds to carefully framed problematics within a given context. Jonathan Tate is principal of OJT, an architecture and urban design practice in New Orleans. The office pursues multi-scalar work through opportunistic development, research initiatives, and conventional client engagements. Tate and the practice have been recognized as part of the 2017 Emerging Voices by the Architectural League of New York. Travis Bost combines his research and design work as lead investigator and registered architect at OJT in New Orleans and as a PhD Candidate in Planning and Geography at the University of Toronto where his work centers on the politics of environmental planning, nature ideology, and critical whiteness studies.